BODMAS – one of my favourite topics to teach. Does it equal 20 or does it equal 14? We can’t have two answers to one question – that would cause all sorts of confusion! So, back in the day, mathematicians got together and agreed to BODMAS – the order in which we do operations. The B is for brackets – we do them first. The O is the confusing one, it stands for “Order” which means squared, or cubed or to the power 7 etc: 52 is an example of an order, and means 5 squared, or 5×5 = 25. Some people use the term Indices instead of Order and so talk of BIDMAS, not BODMAS, but it all means the same. So the correct answer is 14. Remember – BODMAS tells us the order in which we do a sum. If you want to practice BODMAS you can find some questions on this worksheet. 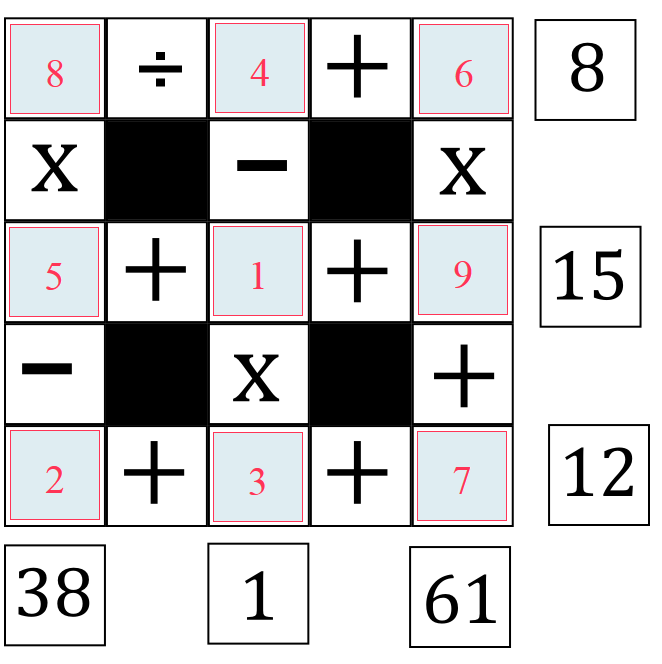 Or you could print out and try this BODMAS puzzle. Here are two great videos that help explain BODMAS. So now you know all about BODMAS, here’s a little puzzle for you to try. Can you arrange all of the digits from 1 to 9 in each of empty boxes below? You can only use each number once. Remember the rules of BODMAS! This entry was posted in Numeracy and tagged BODMAS. Bookmark the permalink. Post a comment or leave a trackback: Trackback URL. Perhaps a Bodmas challenge question could be to find as many different ways to make 1 using 2,3,4 and 5. Thanks again for such a good question. Once you are left with just add and subtract you work from left to right. So you do 69 take away 4 = 65. Then add 9 = 74, then add 15 to give 89. 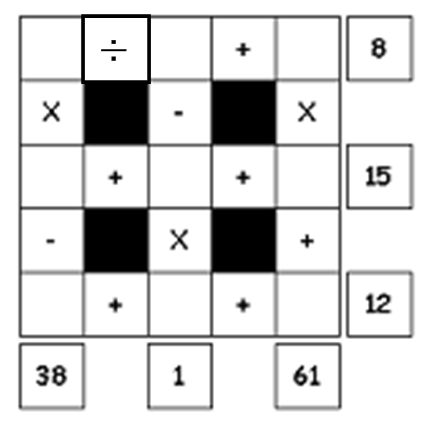 To get the answer 41 you would need to use brackets: 69 – (4 + 9 + 15). I appreciate that it can be a little confusing, but add and subtract could swop places in BODMAS, just as Divide and Multiply are interchangeable. At least someone reads my comments. Over the years I have had a number of requests for the answer to my BODMAS puzzle. I have been a little hesitant about publishing the answer as I do not want it to be too readily available to students. However, I think that it is time to acquiesce, so you can find the answer by clicking on the link below. To whoever is reading this, I hope that you have had a go at the puzzle first, but I figure that if you have persevered through reading the comments until now, you probably deserve to see what the answer is. So click on the link below, and all will be revealed! please can you tell me the solution/answer?